What is a cable drag chain? Cable drag chains are sometimes referred to as cable chains, cable carriers, energy chains or cable track. Their role is to support and protect moving cables. They can be manufactured from plastic or steel and can be used in an extremely wide range of applications. Above is an example of a cable drag chain manufactured from steel. It is also possible for them to be manufactured from plastic. As in the application below. Cable drag chains can be used in a variety of applications, wherever there are moving cables or hoses. Some examples of applications include; machine tools, process and automation machinery, vehicle transporters, vehicle washing systems and cranes. Cable drag chains come in an extremely large variety of sizes. Below there is an example of a small plastic chain application and a large steel chain application. Small Plastic / Large Steel Cable Drag Chain Application. 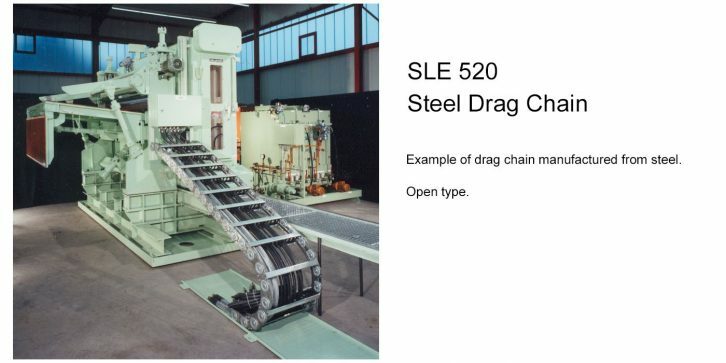 In most cases cable drag chains are used in linear applications as in the instances above. ie the chain moves back and forth between two points in a line. However cable chains can also be used in circular or rotary applications. Here a cable chain can be used in an application where the cables connect two points turning relative to one another. 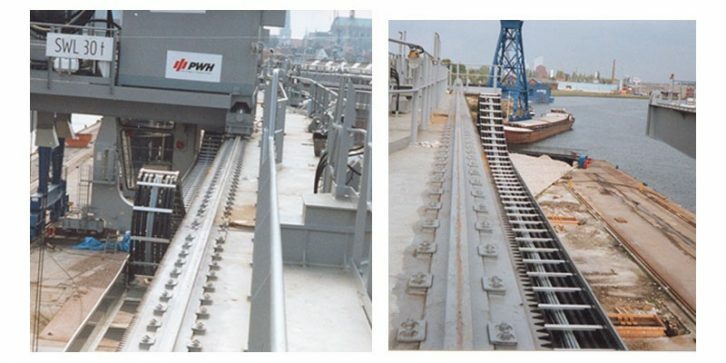 Examples of Rotary Cable Drag Chain Application. There is virtually no limit to the length of a cable drag chain application. They can start from a travel length of less than a metre up to travel lengths of over 100 metres. For excessively long travel lengths extra care needs to be taken that the cable chain is properly supported or that load and friction are kept to a minimum. For example the Marathon system is designed to support cables over long travel lengths whilst keeping the force required to move the chain to a minimum. Very often the chains in long travel systems slide on themselves. Steel cable chain for demanding applications.